As the 2014 has already started I was thinking of making a list/collage of my favorite Ebay clothing bargains over the year! I’ll also make top list of my favorite accessories (tune in tomorrow), shoes & bags (next week!). I hope you have liked my Ebay series & I am surely thinking of continuing them this year too! You have a really cool blog. I'm following you now on gfc! I love the pink sweater. Love 2, 3, 5 and 8, looking forward to many of these terrific posts from you in 2014 Maddie. Hope you're having a fantastic start to the new year! The tiger leotard is a must! I love the ebay series, and I lovee these choices, of course! The plaid and the lace stands out for me, and also the tee! Love this series because it's so different and a great way to find some great deals! I always like your ebay bargains 😀 Would be great if you'd continue in 2014. As always I do admire your choice and sense of style, those items look great! Dear, Maddie, as the new year renews all the happiness and good tidings, hope the joyful spirit keeps glowing in the your heart forever! Happy New Year! want 4,5,6. 1 is wow! Happy new year. my fave is no.8 <3 thanks for sharing them! ilohe the hoto number 4! The pink sweater ( number 2) and the white midi skirt are absolutely my favorite. Love the plaid shorts and the white top ♥ Great pieces! Loving your picks, especially the skort. I love that rose top, white top and white skirt! So pretty! in love with number 1 i've been looking for a tiger print body suit for ages finally ive found one! thank you! Yes, I love your Ebay series and think you should definitely keep doing them. You always find the best items and each time after seeing these I just want to go shopping! My favorites are the two shirts-numbers 2 and 8. That light pink color is so pretty and I love the rosette design. Both shirts are so girly, which I love! Cool collection and yes we will look forward to your other post. MADDIE YES! DO THESE PLEASE! YOU MAKE MY LIFE THAT MUCH EASIER HAHAHA! YOU ALWAYS FIND THE BEST THINGS ON EBAY! gorgeous pieces! love the flowers blouse, so pretty! Hey maddie, yeah! I like you Ebay series, you picked really pretty stuffs! 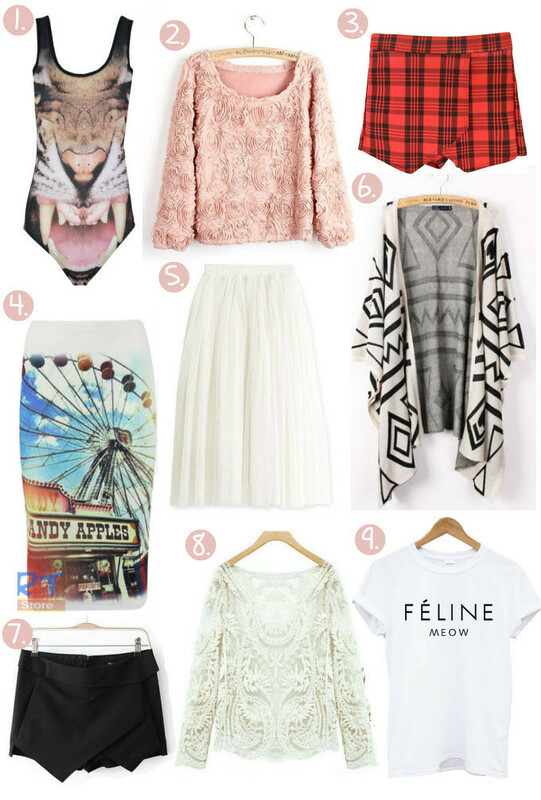 I love that skirt with the ferris wheel print, that's a really fun piece!